Monica Ratliff is launching her City Council campaign. What they didn’t know was that this interview marked the launch of a Los Angeles City Council campaign — and the beginning of the end of a four-year run on the Los Angeles Unified School Board. Ratliff is known as a stickler for transparency. In fact, her meticulousness about procedures has even become the brunt of jokes at the school board. Former Superintendent Ramon Cortines kidded Ratliff at his final State of the District speech last year for her habit of “asking just one more question after we tirelessly answered 20 before.” Even Ratliff regularly acknowledged at board meetings that some of the LA Unified staff would probably prefer to duck for cover when she unleashes her barrage of questions. Now Ratliff hopes to bring that scrutiny to the city of Los Angeles. She’s already researched issues as far ranging as horses, housing, high-speed rail and jobs for her district. But she’s also hoping to educate the city council about, well, education. Although she filed to run in March, she expressly said she didn’t want to discuss her candidacy until the school year ended because she didn’t want the distraction from her teaching duties or the important decisions with the school budget, which was passed last week. She also didn’t want it to be on school board time, or at her district office. And so, for more than an hour, Ratliff met with LA School Report at one of her favorite local coffeeshops, the Back Door Bakery, and at Sunland Park to discuss how she’s planning to bring education to city government. If Ratliff wins next May, local schools will be more than a backdrop for City Council photo opps. At 46, the lawyer-turned-teacher declared she is running for Council District 7 in the northeast corner of the San Fernando Valley when Felipe Fuentes decided not to seek re-election. So far, 18 people are running for the seat. Ratliff’s campaign manager is her fiancé, screenwriter Chuck Kanganis, whom she is planning to marry next March, the same month as the primary. She rented a home in Sun Valley from 2002 to 2007 and since 2008 she’s been living in an apartment in Sunland, so she knows the area well and has seen significant changes. She grew up in Phoenix, daughter of a Mexican immigrant mother and Anglo-American father, who died when she was a teen, leaving her to help her mom raise her two brothers. She went to Columbia Law School on a scholarship, earned her law degree and worked with the NAACP Legal Defense Fund and Neighborhood Legal Services and even acted in a Lionsgate movie, “Battle Force,” before getting her master’s degree in education at UCLA. 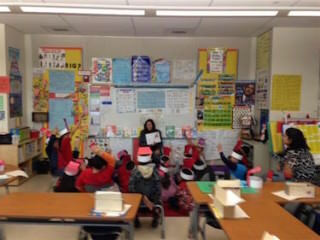 Since 2001 she’s taught third, fourth and fifth grades at San Pedro Elementary and recently taught English Language Development at La Cañada Unified. “I was so incredibly grateful to have the opportunity to work with students again. The students, teachers, paraprofessionals, administrators and parents are great. I ended this school year with lots of plans for next year. I hope to be back there in August.” Although she has no children of her own, she feels like she has had plenty. So far, no one is running to replace Ratliff in her District 6 school board seat, and she plans to remain there until the end of her term on June 30, 2017. Here are excerpts of her interview, edited for length. Q. What prompted your final decision to leave the school board and run for the city office? “It was still up in the air until recently. I filed, but it wasn’t until I saw how we were graduating kids and I realized we were in great shape. I think (the latest school superintendent) Michelle King has done a phenomenal job. She cares about this district, she wants this district to succeed, she grew up in this district. “I think we’re constantly bringing in superintendents from other places that may or may not have a love for this district. She has that, this is her world, it’s her baby. She loves these schools, these kids, these staff members, she wants this to work. She’s done an amazing job of quietly, kind of behind the scenes, making decisions that are meant to put the district back on a stable financial footing and our kids are graduating at a much higher rate because of her ‘all hands on deck’ approach. Walking door to door in her last campaign. Ratliff is chairperson of the Budget, Facilities and Audit Committee and led a committee to help uncover the iPad scandal. She’s made it no secret that her primary goal is to put the district on the path toward financial stability. A regular school board meeting day could last nine hours and require more than 1,000 pages of supplemental material to digest. A lot of it deals with contracts that are tough even for someone with a law degree like Ratliff to understand. Q: Are you confident that the district is going to be financially stable? Q: You are known for taking deep dives into the finances and contracts and have even been complimented by your fellow board members for doing so. Will that kind of scrutiny be lost when you leave the school board? When Ratliff was elected to the board, her closest allies perhaps were Marguerite LaMotte and Bennett Kayser. LaMotte died in office, and Kayser was voted out of office in the last election. Since then, Ratliff forged allies among the board. Two fellow board members, Vladovic and Ref Rodriguez, have already pledged support for her city council campaign, and a state legislator will soon announce an endorsement. Ratliff personally called each board member before filing in March to privately tell each of her intention to run for city council. She received support from them all, she said. Q: You have been on a board with seven very diverse board members with very different opinions and some would say it was like herding cats. So why would you want to go to a situation where there are 15 council members and 15 cats to herd? Ratliff said a constituent prodded her early on to run for Fuentes’ seat and pledged to donate the full $700 allowable for the campaign. That helped give her momentum. For her school board campaign, Ratliff was up against 14 competitors and then faced a run-off against Antonio Sanchez who raised $2.2 million compared to her $52,000. She received the endorsement of UTLA, the teachers union, but specifically avoided other special interest contributors, as she plans on doing again. She won her school board seat with 52 percent of the vote, garnering 20,243 votes to 18,779 for Sanchez. Q: Where do you see most of your support coming from for the city council race? “I would hope ideally to get donations from my actual constituents who live in the area and support me. I’ll be honest, if I wanted to, I can pursue all the special interests, you know who they are. For the school board, I was not financed by special interests, and it’s hard because basically you have to rely on friends and family. Ratliff said it’s tough for the average person to run for office because the system is so complex. Even with a seasoned treasurer to help with her campaign, it’s complicated to follow all the rules and record keeping. Mayor Antonio Villaraigosa’s Coalition for School Reform, former New York Mayor Michael Bloomberg and LA philanthropist Eli Broad all contributed to her opponent, Sanchez. She’s ready to face the same big-money opposition in the city election. Q: What do you think of the new Great Public Schools Now plan? “I wish that they would devote some of those funds to changing the way the teaching profession is viewed and changing the way we fund education. Ratliff in her classroom at San Pedro Elementary. Q: But isn’t that just throwing more money at the problem? Q: So what can the city do? “There are a lot of things they can do, and it’s fine if the proposal is actually neutral to the district and it is all city funded. But what I’ve learned is that the road to hell is paved with good intentions, and people think they’ve got an idea, and it’s like building a bridge as they’re walking on it. That does not seem to work out well. “Now when I drive to La Cañada from here I see some stunning greenery, even in the median islands and it is with recycled water. It’s not that way in Sylmar and Pacoima. Why not? Where is the support? Q: You have been going to Neighborhood Councils a lot, volunteer groups that advise city council members. Is that one of the reasons you decided to run? 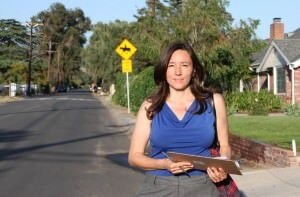 She mentioned things like more green spaces and more crossing guards for schools that have come up at her local Neighborhood Councils in Sylmar, Pacoima, Lake View Terrace and more. She said that constituents have told her they would like to see a movie theater in the Sunland area and maybe a Trader Joe’s grocery store. Q: What do you think the major problems are? “I thought omigosh the real problem people have is poverty. Then I thought if I become an educator I can help eliminate poverty. And yes, I think in many ways if you’re an educator you can help people long term get out of poverty. Q: Your district also includes some wealthy areas, and probably the area with the most horses in Los Angeles. Are you a horse person? “Oh yes, of course in Shadow Hills. There is an equestrian aspect to my district. I’m not a horse person per se, but I’ve thought a lot about horses. I’ve ridden horses a couple of times in my life and certainly enjoyed it and think they’re very powerful and beautiful creatures. “What I’ve learned about horses is how they react to sound and there’s a lot of controversy about high-speed rail in my district. I’m opposed to high-speed rail coming through this area. It offers no benefits to the community. It doesn’t even stop anywhere in the community. It’s basically just using the community to run through and it’s going to have a huge impact on the horses, because horses are very sensitive to sound and they spook easily. Q: What are some of the successes that you’ve seen as far as educational reform? “I think it’s unfortunate that the term educational reform is co-opted by charters, but it can mean more. I think that there’s been a promotion of autonomy because of the reform movement. Q: What are some necessary improvements? “I think teacher quality is impacted by principals being able to come into the room and offer suggestions and feedback. The principals need to be instructional leaders themselves. They need to know what good teaching looks like, what it feels like, and they need to be effective communicators and need to be able to express that to the teacher. Q: What is your prognosis for the kids of LA Unified? “I think the prognosis is good. I think LA Unified is doing a really good job in focusing on kids, and that’s clear from the increasing graduation rates over the years. It is clear from where the funding goes, the arts instruction, the magnets, the wellness centers, and I think LA’s kids are in good shape in terms of LA Unified. 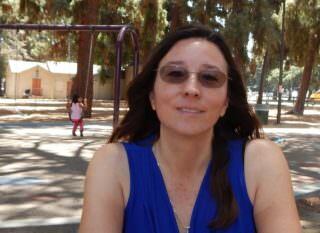 “But LA Unified, and I would say a lot of school districts — I don’t care what size you are in this state — need help.